We had such fun with the first four Writer's Travel Kit, which quickly sold out, we designed a fifth set. We only have 35 of these-- they will go fast. A lucky green clicky pen w/Neil's writing advice printed in silver, a tote bag, 18 postcards and a luggage tag. Everything a traveling writer needs to get around. The luggage tag is hard recycled plastic to withstand all of the rigors of travel. MORE ON THE SANDMAN ANNOTATED HERE. to further sweeten the deal, I got Neil to sign a few bags and stickers- I will send them in random orders. I thought it would be like the Willy Wonky golden ticket, and a nice thank-you to his readers. TO BE CLEAR: they are not all signed! There is actually a pretty good chance of getting a signed Neil bag for a steal. CLICK HERE to get your kit! 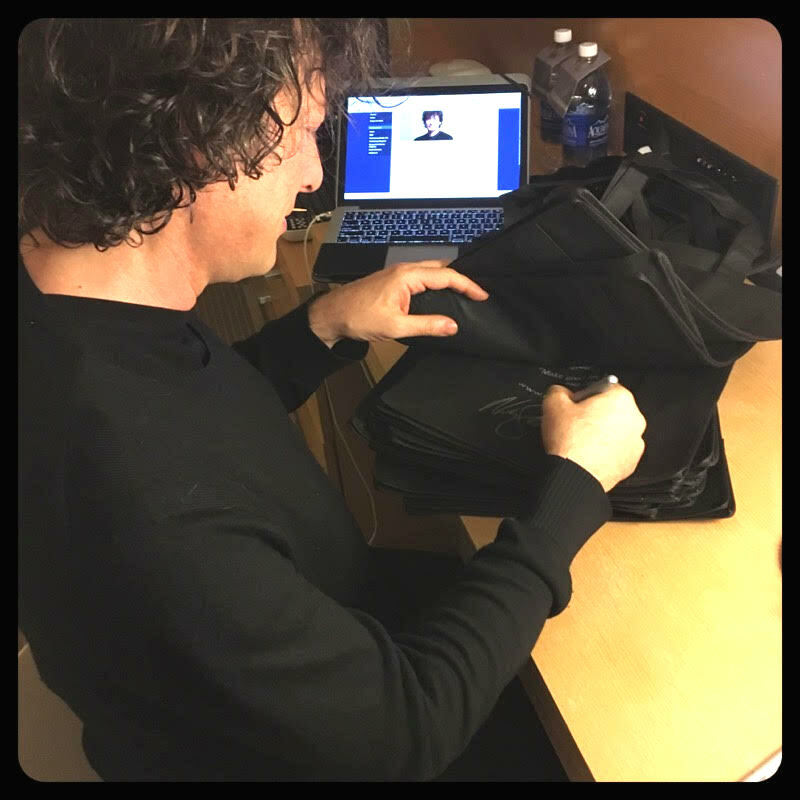 We are packing ALL the kits up and throwing them in a big bin, so we will not know who gets the signed versions. 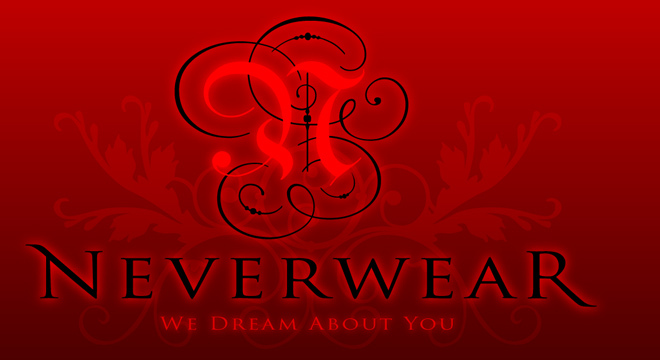 Hope you will post your prizes on the Neverwear Facebook page: HERE. We would like to introduce you to our newest artist: Paul Roman Martinez! 1. How did you come to work with Neil Gaiman? Did you know his work before this? It was the early 90s, and I was probably about 12 years old going to my local comic shop. Alongside Batman, Superman, and Swamp Thing, I found this crazy Sandman comic with even crazier covers. 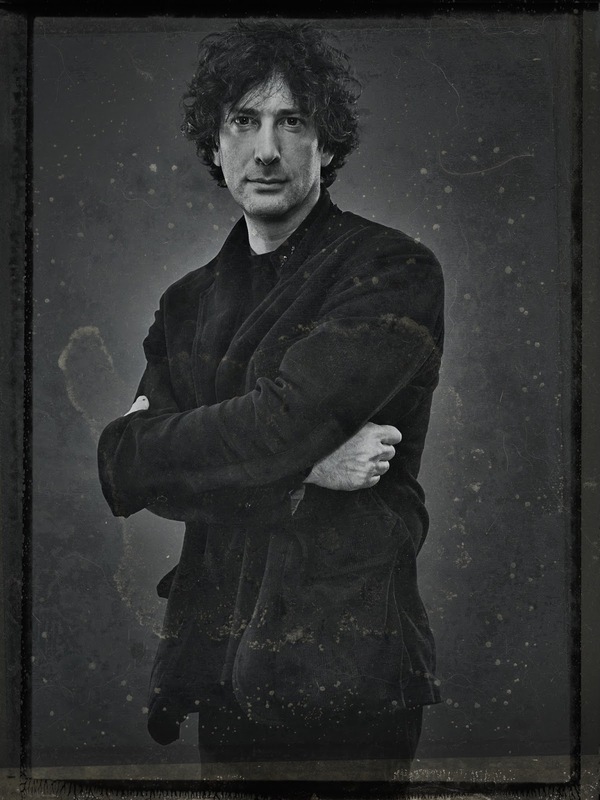 That was the first time I picked up anything by Gaiman, and I think he showed everyone what comic book storytellers were really capable of. To be doing any kind of project with him is definitely a dream come true, thanks to running into Cat at San Diego Comic Con this year. Although, even being at San Diego Comic Con with my own comic was already a dream come true. Oh no, my life has become a crazy Vertigo comic! 2. 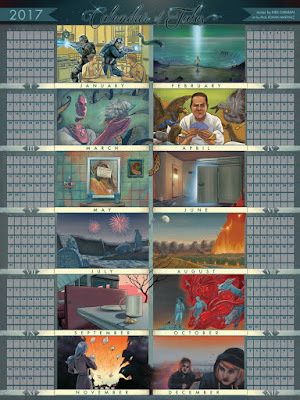 How did you approach these Calendar illustrations to combine into one big piece? Are you formally trained as an artist? Process? The stories the illustrations are based on come from very unique worlds and have little crossover with each other, so I wanted elements to climb out of the stories as if they were published in the same book. Characters and objects bleed into the pages where they don’t necessarily belong. I have almost no formal art training and only a little graphic design training, but I’ve spent years working on my craft, and I’m constantly pushing myself to do better. For the calendar, I began by reading the stories and drawing very rough sketches of what the illustrations could be. Then I reread them and made changes to my drawings to better match the writing. I approached these pieces in a very comic book way, meaning sketches first, line art, flat color, and then final color. And throughout the whole process, I kept looking for subtle ways to get the illustrations to overlap, constantly rereading the stories to make sure they really connected to the sources. *Here is the Calendar poster print, on sale for the next few days for $15! The first 50 orders will also get this Allan Amato photo poster! ORDER HERE. 3. Tell us which was your favorite month to illustrate and why? Looking once more at the illustrations, I can’t say any of them were my favorite. At some point in the process, I was staring at each one separately from the others just trying to find that magic element in the piece I was working on. For March, I love the blank stare of the woman holding the ship. Her eyes are so pale, they’re almost not there. For October, I love the animals floating around the genie and the simple two-color scheme that helps put them in such an otherworldly place. For November, I love the contrast of the simply-colored fire on the black and purple sky. You can never tell one of your children you love them the most! 4. Can you talk about your deck of cards you produced? Sure! Probably the biggest thing I learned during that process was how passionate the playing card collecting community is. They have a voracious appetite for new decks, and they have very strong opinions about what they want! I even submitted early concepts to some playing card collecting groups and got some serious feedback on how the cards should be designed. I don’t usually do that, but I’ve also never had a group that eager for a project before it even came out! To date, that was one of my most successful endeavors on Kickstarter, and it even sold out through my distributor several times. I had card distributors asking me to do reprints so they could sell the decks. But for me, I have to find a new challenge to revisit that world. I always have a few projects on my desk, so to spend time merely reprinting a deck for money doesn’t seem very exciting. The first series featured real aviators and airplanes from the golden age of aviation. I even got to speak with Charles Lindbergh’s daughter about the project, so it would be hard to top that! 5. What are you working on now? Future plans? Right now I’m working on five or six different projects at various levels of completion. My main work is always my ongoing graphic novel series, The Adventures of the 19XX. And while I work on that, I’m also producing artwork, shirts, messenger bags, and anything else I can think of to carry the art and story of the series right off of the page and into the third dimension. The story is set in the 1930s, between the wars, in a world where supernatural mixes with retrofuturistic machines, which gives me the best imagery to play with for any medium! In the next year, I’ll be releasing the fourth book in the series, and a new release always comes with another round of exciting challenges! The series is set to be six books long. So, for the foreseeable future, I will be spending a lot of time in the Dieselpunk 1930s. Paul Roman Martinez self-publishes his own graphic novel series, The Adventures of the 19XX, and produces art linked with history, often from a time removed from our own. His goal is to tell stories through his art, his writing, and his graphic design, no matter what format or medium. It was wintertime in the midwest, a few years back. 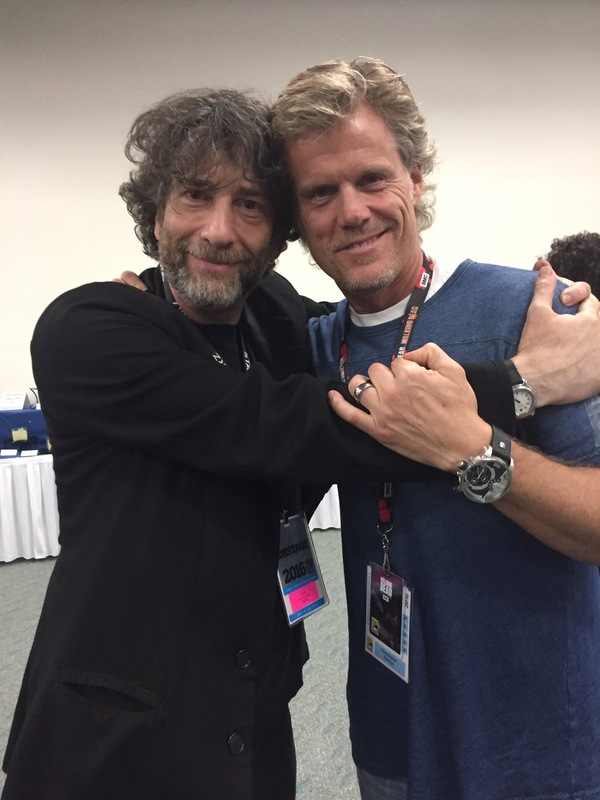 My boss Neil Gaiman and I holed up in his Addams Family house while he did a big Twitter project, A CALENDAR OF TALES, with BlackBerry. Neil sent out tweet prompt questions about the twelve months of the year and his followers answered with ideas. After poring over thousands of entries, he picked his favorites and then wrote twelve gem-quality stories, one for each month. 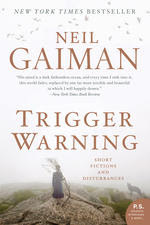 These stories were published in his last short story collection TRIGGER WARNING. Fast forward to San Diego ComicCon 2016, Husband was walking the con floor when he happened on Paul Roman Martinez's booth. What a find!! 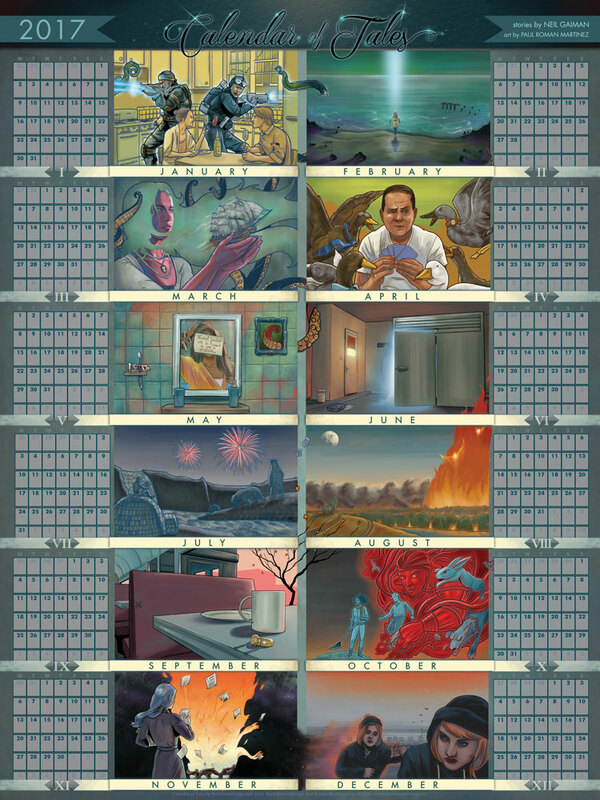 We approached Paul to make a wall calendar poster of the stories, and he intertwined them into the magical piece you see before you! It's a full color 18" x 24 " calendar poster for your year ahead *2017* on a matte aqueous coated paper, printed right up the highway in gorgeous Van Nuys, California. $15.00 until Neil's birthday (Nov 10) then they will be sold for $18.95 each. The first 50 orders will get a bonus poster of Neil as photographed by the amazing Allan Amato. CLICK HERE TO ORDER YOUR NEW WALL CALENDAR! NEW! signed-by-Neil bookshelf print plus a chance to win an American Gods iphone case! 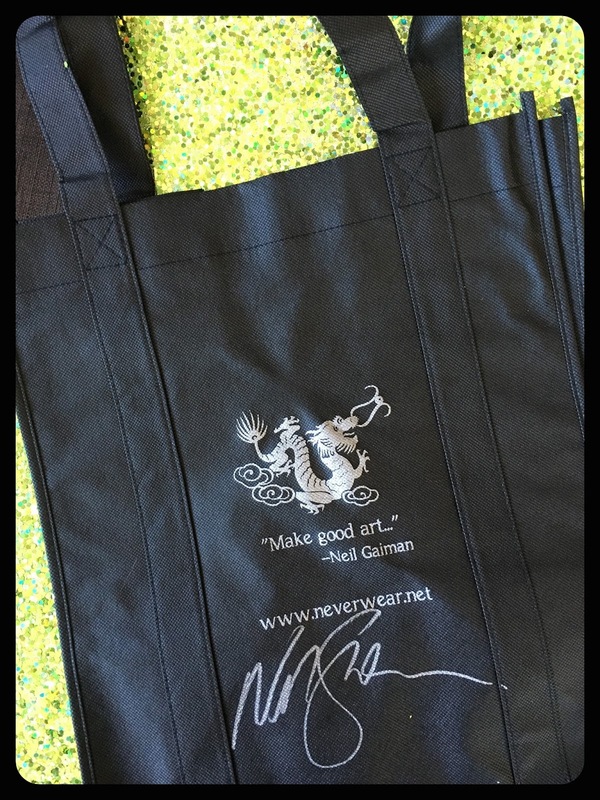 We bought a very small amount of these that Neil has signed to sell here on Neverwear. Jane has also signed them for us... $85.00 (we only have 30 of these) ORDER THEM HERE. 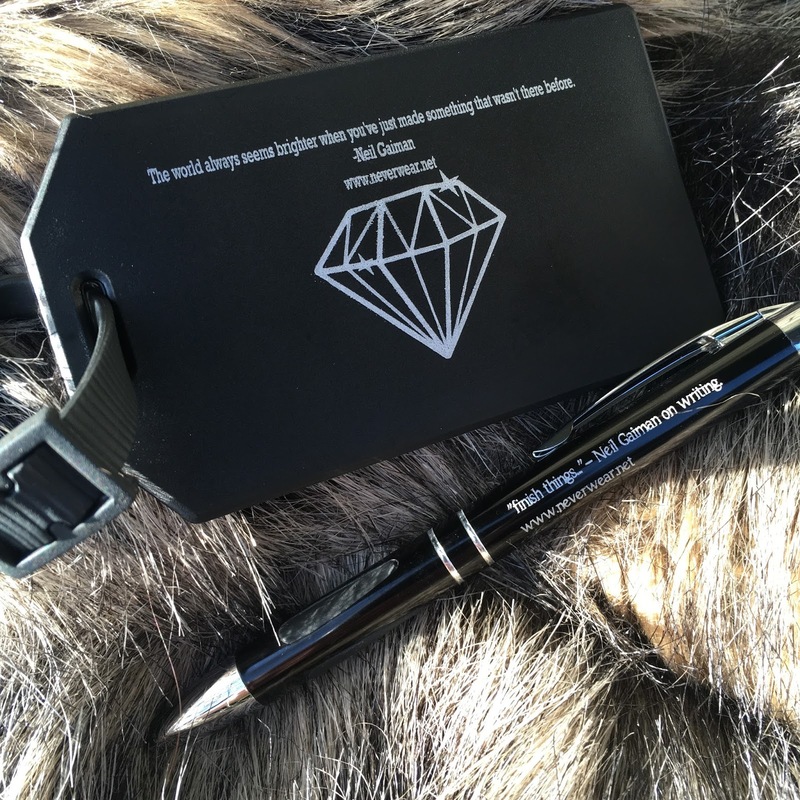 A percentage of the proceeds will go to The Gaiman Foundation, another percentage will go to a tiger sanctuary called BlackJaguarWhiteTiger. Also: any (ANY) purchase made from Neverwear this week, Sunday July 31-Sunday Aug 7 will be eligible to win this gorgeous iPhone 6 case that I had Neil sign at this year's ComicCon. We will pick the winner at random from the orders. we had such a blast at this year's Con. Great getting to know the cast and the amazing teams of Starz/Fremantle. the grande American Gods booth, the neon was so glorious on the floor. Wanna see the AMERICAN GODS trailer? Neil's journal post from SDCC 2016, is HERE. Meet Jim Batt, who is creating the wonderful stop-motion short film of Neil Gaiman's poem: IN RELIG ORAN. 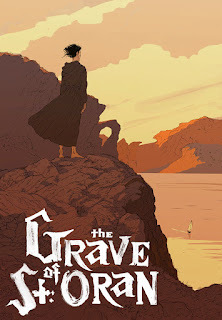 The film title is THE GRAVE OF SAINT ORAN. Please consider backing Jim's Kickstarter HERE>! Only a few days left to get in on this campaign, and we have sent Jim a few signed Neil prints, illustrated by maestro Michael Zulli. I did a little interview with Jim, read on! 1. What inspired you to work with Neil? How did you meet? 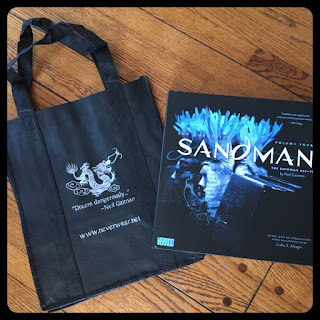 I've been a long time admirer of Neil's work, since I first read Sandman really - which I first encountered at my university library. 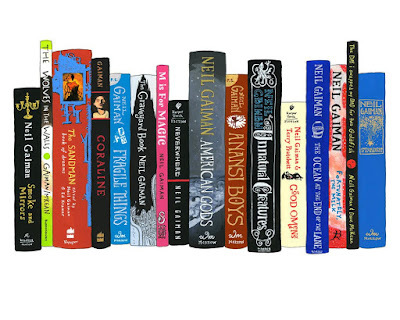 I would while away the hours between lectures, losing myself in the overlapping stories and strange yet familiar characters. Those books will always bring back memories of musty bookshelves, leather chairs and low voices of people arguing cartesian philosophy or swearing they really do understand postmodernism. Years later, I was lucky enough to get to know Neil through both Kim Boekbinder and Amanda Palmer. I think we first met backstage at a gig, but would cross paths in various parts of the world fairly often, as our friendship circles overlapped in a big international art family. Neil's writing, the deft way he weaves together our world with magic and myth, has been a big influence on me, so getting the chance to work with one of his stories is an amazing opportunity. 2. Why did you chose to illustrate IN RELIG ORAN? I had finished of a long year of work, and was looking about for my next personal project. I'd had the poem stuck in my head for a while, something about the oddness of the story and the rhythm of it had caught hold. It's such a strange story - equal parts myth and history, philosophy and horror, I think of it as a kind of existential ghost story. But at the heart of it all, is the big question humanity has always faced - how much do we really understand about our place in the world? A question that is approached with both curiosity and fear, but never leaves us. It was that line "He will touch you, he will taste you, he will leave his words inside you - god is not what you imagine, nor is hell, and nor is heaven" that really made me want to explore the story further. 3. Do you think your work with Amanda on the brilliant WANT IT BACK will inform this film? 4. You reside in Melbourne, Australia. Is this where will you be filming THE GRAVE OF SAINT ORAN? I've been splitting my time between Melbourne and New York for a while now, and I intend to shoot this project here in my Brooklyn studio this time around! 5. Do you have any other upcoming project are you especially excited about? Over the last year or so, Jherek Bischoff and I have been working on series of videos to accompany his next album and its looking amazing. And I've been doing a lot of work with Kim Boekbinder and Molly Crabapple, creating illustrated political animations that touch on some really important topics. So keep an eye out for those! 6. If you could meet any of Neil's fictional characters, who would you like to have a conversation with? Coraline is easily one of my favourite characters, but I suspect Hob Gadling would make for a very interesting evening of conversation over a few drinks. He likes to talk, and has seen a lot in his many years on this planet. 7. Who might play you in the movie version of your life? Wait - I thought this WAS the movie version of my life? 8. How do you plan to promote this film? What is your best hope for where the film winds up? Once the film is finished, we're hoping to get it into a few festivals. Obviously all of our backers will get their own private online screening, but we'd love to send it out into the world for some big screen love - it would be a dream to get into some of the top animation festivals like Annecy or Stuttgart! 9. Do you have someone in mind for the soundtrack for the film? Yes! We're incredibly lucky to have musical maestro Jherek Bischoff onboard to score the film. Can't wait to see what he dreams up, his music is always so evocative. 10. The best digital link to find me is: @battsignal on twitter if you want to say hello, or www.jimbatt.com if you want to see some of my other work. the best analog place to find me is: At my local East Village cafe, drinking coffee and working from my laptop. Sean von Gorman watercolor print RADIOACTIVE MYTH. Sean Von Gorman has done it again. He has presented us with this imagined view from the past, what if Neil had an origin story like Spiderman. 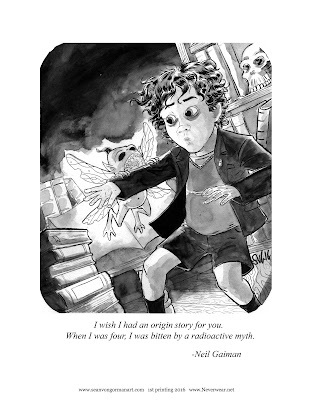 That New York sensation, he of the Houdini, Pawnshop & ToeTag Riot comics fame-- Sean has created a little Neil Gaiman-- in the style of one of my all-time favorite artists: Charles Addams. Q: How did your interest in mythology start? A: I wish I had an origin story for you. When I was four, I was bitten by a radioactive myth. This will be a run of 300 on a gorgeous pearly stock. Printed right here in Hollywood, California U.S. of A. CLICK HERE TO GET YOURS. 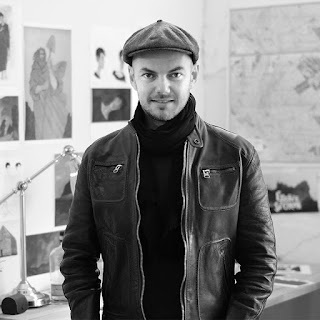 Sean is a super-talent, hint* ---> watch this space for some news about another joint project from us, me writing, Sean illustrating. You can support Sean as well by asking for his latest title TOE TAG RIOT in your local comic book shop! 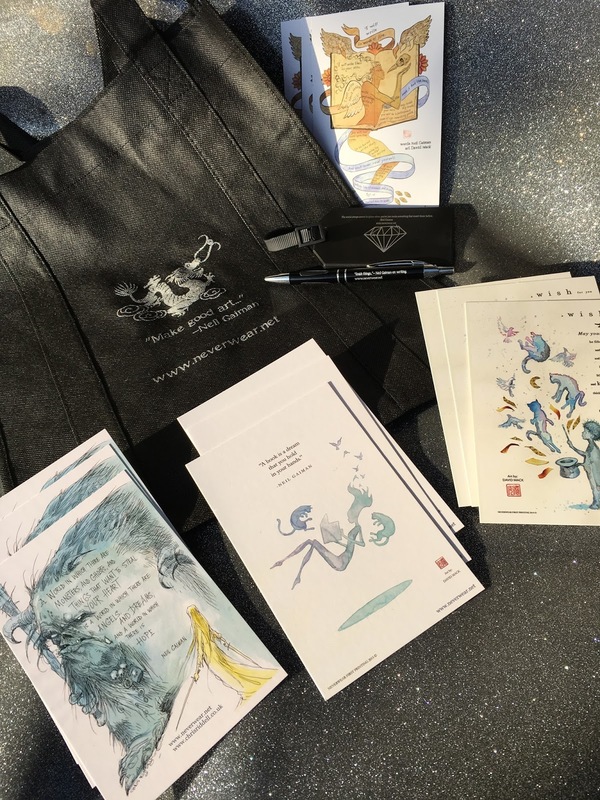 a portion of the money collected will go to THE GAIMAN FOUNDATION, Neil's support of the art community-- and some will go to BLACKJAGUARWHITETIGER, which is a big cat reserve in Mexico. go see their site: so many happy rescued lions & tigers!